Do you provide instruction or share resources with your students using the Internet? This is okay if you created the materials. However, if the content is from another source you may be violating copyright. Do not put your career or the school district at risk! What are the Risks When Sharing Files? Today it is simple to provide instructions for school work digitally. A teacher can list directions, create a video, or link to a file using a classroom website, blog, or web-based service. If you did not create the text or materials, you could unknowingly infringe on intellectual property rights, violate copyright laws, or breach a license agreement. If this happens, you place yourself or your school board in a vulnerable position. The copyright holder can seek damages. This can result in financial penalties. In addition, you risk breaking the terms of your teaching contract, which could end in job loss. How Will Anyone Know What I Have Posted? Make no mistake, publishing companies and authors, in this very competitive environment, are vigilant in searching for violations of their materials. You may think that no one will notice your classroom website or blog. This is not true. If the file is on the Internet in the public domain, it can be found. Every file that you place on the Internet has a URL. Search engines use web crawler software to troll the Internet looking for new URLs to add to their directory. Soon the information that you posted is available in search engine results and anyone in the world has access. When this happens, you and often the school district where you work, are an illegal distributor of copyright protected material. When you share resources with your students your focus is on teaching valuable knowledge or skills in a meaningful way. You may not have given a second thought to whether you have permission to post the content or if the location is accessible to unauthorized users. Excuses cannot protect you from the consequences. Don’t make these excuses. They won’t protect you! My students like videos so I transformed the content into an instructional video. I created my own handout from the materials. That content was posted a long time ago and then I forgot about it. I only used those resources once for a workshop. Instead of posting the entire thing, I only did one assignment. The person that posted the files doesn’t work here anymore. I didn’t think anyone could access the materials unless I gave them the link. I forgot the password to my blog or website so I cannot login to remove content. The materials are for kids so they can learn. I paid for the materials so they are mine. I am new to the position and did not know. Most copyright holders do not permit the creation of derivative works. A derivative work is taking something that already exists and changing it to make something new. For example, if you take text written by someone else and transform it into an instructional video the work is not owned by you. Or, if you take content produced by someone else and reverse engineer it to change the file type the work is not owned by you. The original copyright holder owns the intellectual property rights to their material even if the format changes. Plagiarism is when you take someone else’s work and pretend it is your own. It is illegal. You may think if you rephrase, delete, or add content to existing work that it is okay. It is not. Paraphrasing text for a presentation, removing part of a set of instructions, or adding questions to existing content is plagiarism. Slight changes do not make you the owner of the copyright protected material. Teachers are busy people with lots of responsibilities. With so much to do each day it is easy to forget about files posted for a class, semester, or half day workshop. However, the Internet has a long memory and the content you only needed for a brief time can remain there forever. You are responsible for everything you post online no matter how much time passes or whether you are currently using the materials. A school or district can be held responsible for copyright violations committed by its staff. This happens when a person posts content to an organization’s website domain, file server, or web-based subscription service. The organization is now the host and is distributing the content. Even if the person who posted the content moves away, retires, or goes to work at another location this does not eliminate the responsibility to the copyright holder. If the school or district is the host of unlawfully posted files they must promptly remove the content at the copyright holder’s request. A copyright holder may grant permission to share content with authorized users. You may think posting the file using a web-based service and then privately sharing a link is okay. However, a web-based file can be accessed by the public even if there is no hyperlink to the file on a web page or blog post. This can happen in several ways. For example, folders on the Internet are trolled by web crawlers and added to a search engine directory making the files accessible to anyone. In addition, the privately shared link may be forwarded onto an unauthorized user. 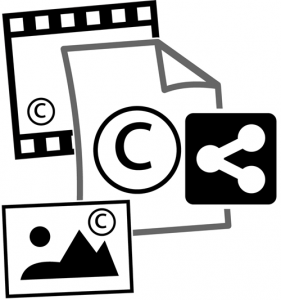 If the copyright holder permits sharing content or files, make sure the location is restricted to authorized users. You may have begun a classroom website or blog with great enthusiasm that waned over time. When that occurs, often a username or password can be forgotten. Unfortunately, the content remains on the Internet and since you are the account subscriber you are responsible for the information. If a copyright holder requests you to remove content, but you cannot remember your login, contact the web-based service and request the account be deleted. Teachers have the best intentions. You want to provide learning opportunities that will engage students. Sometimes, obtaining proper licensing for instructional materials can be cost prohibitive. In this case, you may rationalize that it is okay to illegally use the content because it serves a higher purpose – to educate kids. Caring about students and their learning is an admirable quality but it won’t protect you from the consequences of copyright abuse. When you purchase instructional materials, you may think you are the owner and can do whatever you want with the resources. This is not true. The copyright holder retains ownership of their intellectual property even after you have bought it. You may own the subscription, book, or video, but the actual content belongs to the copyright holder. The rules for how the materials can be used must be followed. If you fail to comply with the terms, even if you paid, permission can be revoked and your use terminated. How Do You Protect Yourself from Copyright Violations? Do I have written permission from the copyright holder to share content or files? What restrictions are in the license agreement limiting the use of the materials? Will unauthorized users be able to access the content or files? Most teachers do not know they are breaking the law when they post content or share files with their students. Use these tips to protect yourself. At all levels, from student to teacher to school district, everyone using copyrighted materials must be aware of the rules and their responsibilities. At the professional and at the classroom level, teach respect for copyright law, what is and what is not legal, and how to share materials. Ask questions to learn about the status of materials BEFORE posting content or files. Find out if and how the owner of copyrighted materials allows users to share files. If you have permission to place the digital resources in a password protected area, not in the public domain, there are a variety of tools available. Learning management systems such as Edmodo and Microsoft Classroom are secure options that restrict users to those with authorized usernames and passwords. School districts can be responsible for hosting material on the Internet using their resources. To protect the organization, the technology department should have administrative rights to remove files. When a teacher moves away or retires, the directories they maintained should be completely removed. If you have files on the Internet for your students and realize your actions violate copyright rules; you must remove them immediately. Deleting the hyperlink on a web page or blog post that connects to the file will not fix the problem. Instead, you must delete the files themselves. Removing the files will prevent others from accessing the materials. It is a good idea to close unused Internet accounts. Most web-based services have online forms that make it easy to make removal requests. If the service does not have a form, refer to their Support FAQ section, or the Contact Us page to learn the proper procedure for closing accounts or removing content. Legally and ethically, copyright compliance is of vital importance. School districts and teachers are responsible for the content and files shared with students. Avoid the consequences by following the rules.